More than five years after the devastating 14-foot high waters of Superstorm Sandy flooded New York and New Jersey, the Army Corps of Engineers is studying methods for reducing the damage of future high waters in the New York Bay and Hudson River estuary—whether with levees, seawalls, beach nourishment, or even a gate that would span from Sandy Hook to the Rockaways (the public is invited to comment on the Army Corps of Engineers proposals until September 20). But would such barriers be sufficient as sea levels rise? Is building big structures—like those protecting the Netherlands—the best use of resources? Klaus Jacob, a disaster and risk management scientist at Columbia University’s Lamont-Doherty Earth Observatory, and Western Carolina University coastal geologist Rob Young, discuss different strategies for managing the storms and flood waters of the future. Klaus Jacob is a Special Research Scientist at the Lamont-Doherty Earth Observatory of Columbia University in Palisades, New York. Rob Young is director of the Program for the Study of Developed Shorelines and a coastal geology professor at Western Carolina University in Cullowhee, North Carolina. IRA FLATOW: This is Science Friday. I’m Ira Flatow. 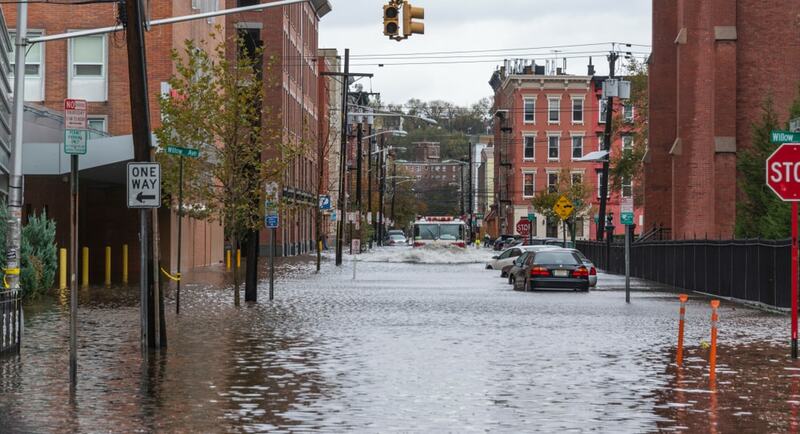 When superstorm Sandy inundated New York and New Jersey, the water rose as high as 14 feet in places. You had your nine foot of storm surge atop an unusually full moon high tide. And the Army Corps of Engineers began looking at options for building defenses against the new wave of storms at sea levels. You know, sea level rise is now the new norm. And on their list of things to research for the New York Harbor, an assortment of levees, surge barriers, and even a sea gate that would span the five miles between Sandy Hook in New Jersey, and Breezy Point in Queens. That’s a line that goes all the way up from New Jersey, up through New York Harbor, follows through Long Island, up into Queens. And if constructed, this gate would not be the first such structure. And you look to the Netherlands, where multiple gates keep the ocean at bay. Or even the levees protecting New Orleans. But as communities around the country look to hold back the rising and occasionally fitful ocean, what can we say about the most effective, cost effective durable ideas? And what about the environmental cost? And just the costs of actually building these? Well, that’s what we’re going to be talking about. If you’d like to join our discussion, our number, 844-724-8255. You can also tweet us @scifri. Let me introduce my guests, Dr. Klaus Jacob geophysicist and special research scientist at Columbia University’s Lamont-Doherty Earth Observatory in the Palisades. He was a member of the 2015 New York City panel on climate change. Welcome to Science Friday. KLAUS JACOB: Thank you for having me. IRA FLATOW: You’re welcome. Dr. Rob Young, director of the Program for the Study of Developed Shorelines and a coastal geology professor at Western Carolina University in Cullowhee, North Carolina, welcome to Science Friday, Dr. Young. ROB YOUNG: Hi Ira, great to be with you. IRA FLATOW: Thank you. Klaus, let’s start with New York and New Jersey. From a disaster management perspective, is this an area to protect from storm surge? KLAUS JACOB: The answer, if you’re only concerned over the next few decades, would be yes. But declaring the war to a rising ocean requires an exit strategy. How do we get out of declaring the war against the ocean? And that’s where the problem lies. If sea level continues, those barriers would have to be closed. Not just when storms come in, as right now. But they would have to be permanently closed. But that means the Hudson River, and Passaic River, and lesser rivers can’t get out to the ocean. So you get actually flooded from behind. So the functionality of those opposed barriers is limited for decades. Maybe half a century, maybe a little bit more. But not for a century. IRA FLATOW: So this is one of the options that the Army Corps of Engineers has decided to look into. And we actually asked them to come on the show and talk about it. But they said, well, they would not now because the study is still in the fact-finding stage, and all the details are preliminary. But there is a commentary period, a comments period still open, right, Klaus? KLAUS JACOB: Yeah, they extended actually the commentary to September 20, because there was an outrage for a very short time window to comment on. So if you have comments, use that time. IRA FLATOW: Klaus, what do you think about, Rob, I mean, what do you think about Klaus saying, you know, this is sort of just a Band-Aid? You build a barrier, but it’s going to fill up with water, create a lake behind you, and flood everything else behind it. ROB YOUNG: Yeah, I don’t disagree. You know, certainly heavily urbanized important cities like the New York City metropolitan area, and those nearby portions of New Jersey, are areas of the country that one would imagine as a nation we would prioritize for providing some level of protection from future storms. And at least as long as we can, from sea level rise. It’s a complex system, and you know, even the Corps admits that the solutions they’re proposing would not guarantee complete protection. So I hope that this process will really take an honest look at what they can and can’t achieve. And how long that the system would actually practically function. IRA FLATOW: And so what would you think? Is there a better remedy that you would suggest? ROB YOUNG: Well, you know, if we’re just talking about the New York City metropolitan area, then it may be worth it for us to spend federal and state tax dollars to provide decades of protection. And this is assuming that they can get this project completed within the next decade or two, which that’s open to question. The questions that are more important to me are what we do outside of those major metropolitan areas. Because we’ve got thousands of miles of shoreline in the United States, including a wide variety of different kinds of communities. And you know, New York City is sort of one of those end members. There’s not a lot of people that are going to argue that we should be walking away from there, or not thinking about ways to protect that. But it’s all the other places that are between New York City, and Miami, and New Orleans, where it gets really complicated. IRA FLATOW: And so for them, what do you suggest? You’re not going to build seawalls or gates in all those places. ROB YOUNG: Absolutely not. And this is the big issue really, is that we can’t hold every shoreline in the US in place forever. We can’t guarantee protection for all of these communities forever. You know, we can’t even guarantee that protection for this year. And right now, we’re sort of acting like we can. We spend a lot of money on coastal protection. The Corps got $6 billion after Sandy, and they got almost $16 billion after Irma and Harvey in the last appropriations bill. And they get that money, but there’s actually no national plan or vision for how we should be approaching our nation’s long term coastal protection and long term coastal adaptation planning. So we’re spending a lot of money. But it’s not happening in any sort of organized fashion. It’s reactive rather than proactive. And projects like this New York City project sort of happen in a national vacuum. We’re spending federal dollars, but we’re not really taking a systematic regional or national approach to understanding where the most cost effective places would be to spend that money. And, you, know what places we will by necessity need to walk away from, and which places where we can protect for a few decades. IRA FLATOW: But you know, we have an administration that doesn’t believe that global warming is worthwhile even talking about, or climate change, or, ocean rise or any of that stuff. Right, Klaus? KLAUS JACOB: Well, let’s leave that aside. So I mean, that’s one of the key questions because you don’t have to adapt as severely in the future to sea level rise if we keep greenhouse gases to a minimum. But let’s first go back. We talk a lot about protection of the shorelines and coastlines. That is only one of the three possible modes of adapting through rising sea level. So protection and defense against it is one. Typically, that’s done with engineered structures. And that costs money. And so they have to be typically focused on areas like, let’s say, New York City, San Francisco Bay, maybe the Houston-Galveston area, and so on, where there’s a high concentration of assets that we have built over the centuries. Forget about Florida, you cannot protect these seawalls in Florida because there’s limestone under these. And that’s what’s called caustic. Means it has a lot of holes like a Swiss cheese. And the water would run right underneath. So it doesn’t matter if you build a wall on top. The second option is not protection, but accommodation. That means you stay in place and for instance, for the New York City skyscrapers in lower Manhattan, you would give up first the basements, and then the first floor, and then the second floor. And you move the infrastructure to higher elevations in the building. You have to have, of course, the infrastructure being submersible. But the most sustainable long term solution is the political hot potato that nobody wants to touch. It’s called managed retreat, or I sometimes call it assisted retreat. Because communities that have experienced already flooding in the past, and more so in the future, often are quite interested and willing to give up their places if they find a benevolent government that helps them to do so. IRA FLATOW: So Rob, you agree that eventually we’re going to have to retreat? And that really is the long, long,long term solution, and we should be preparing for that? ROB YOUNG: Certainly as I said earlier, we can’t hold all of these shorelines in place forever. And so that means that there will be sections of our shoreline that we will need to take a step back from. And in some places, that will happen earlier than in others. And probably in stretches of shoreline that are small resort communities with a low density of development, the federal government is not going to be willing to guarantee for the next five decades and longer that we’ll be holding those shorelines in place. And so I think that the sooner that we are able to have a national conversation about how we’re spending our federal dollars, and where we can have this kind of accommodation, and where we might try to hold shorelines in place for a bit longer, like our urbanized areas, the more wisely we will be investing that money that we have. IRA FLATOW: Let me go to the phones. Lots of people want to talk about it. Let’s go to New Barrel, North Carolina, to Sean. Hi Sean, welcome. SEAN: Hi, how’s it going? SEAN: Hey, good. Listen, talking about Hurricane Sandy, I know for a fact that there are three 30 foot waves that breached the barrier island there in Ortley Beach, which was the epicenter, pretty much the epicenter of Hurricane Sandy. I’m curious to know, this sea gate that they plan on, suggesting building in New York, how high do they expect to build that gate, with possible storm surges as high as 30 feet? And one other question is what makes us think that man can control or stop Mother Nature? I mean, you look back to the flooding in Mississippi back in, I think was in the late ’90s, when all the levees were, a bunch of levees were breached by flooding out there. IRA FLATOW: OK, good questions. Robert, yeah? KLAUS JACOB: Well, I mean, there was no 30 foot waves during Sandy. The storm surge on top of the regular tides was short of 10 feet. So I’m not sure where that rumor from, the caller referred to of 30 feet comes in. But you see, it’s not as important to ask how high would be the barriers. Yes, that’s important whether you defend against a 100-year storm, a 500-year storm, a 1,000-year storm, or whatever. Which actually is a misnomer. It means it has an annual probability of one in 100, one in 500, one in 1,000. But what’s important in the context of sea level rise, it doesn’t matter how high you make the barriers to keep the ocean out, because the rivers need to get out to the ocean. So you can make it as high as you want, if you want to spend a lot of money. That does not prevent you from being flooded from behind. IRA FLATOW: Yeah, that’s a good point. This is Science Friday from WNYC Studios. I’m Ira Flatow talking about sea level rise with Klaus Jacob and Rob Young. We’re talking about what you could do, you know, after Hurricane Katrina hit in 2005, New Orleans invested heavily in its levee system and rerouting waterways to prevent another Katrina. And yet they’re still considered at risk of another disaster. Did they do something wrong or, well, what? Rob, what do you say to that? ROB YOUNG: Well, it’s a pretty complicated, in some degrees impossible, task to try and provide storm protection for Southern Louisiana. I mean, this is an area that has the highest rate of relative sea level rise in the continental United States. We’re looking at sea level rise of around 9 millimeters a year, which is double the next highest rate of rise in the country. You have an area that’s subsiding and suffering significant land loss. And so the protection of that area is very, very difficult. And the state of Louisiana has some very detailed plans to continue to build a wide variety of different coastal fortifications. They’re rebuilding barrier islands. They’re restoring wetlands. They are doing river diversions to add sediment to the tops of the wetlands. But none of those things can guarantee that nature won’t find a way to cause another Katrina and flood New Orleans again. You just simply can’t give that kind of a guarantee. And you know, I think folks in Louisiana are finally recognizing that the map of Southern Louisiana will look different a few decades from now than it does today. And they are strategically stepping back from some portions of the coast, by the decisions they’re making on where they’re putting the levees. And they’re leaving some communities on the outside of those levees, and I think everybody acknowledges that that’s signaling the end to those places. IRA FLATOW: A tweet from Brian, who says about the Hudson River, can it be dammed upriver and diverted into the Long Island Sound? Then New York Harbor is below the new sea level. And pump to maintain a semi consistent level. So that sounds like this way you’ve got the, going into the Sound. KLAUS JACOB: Nice idea, but hard to do. Because again, the Hudson River wants to equalize in elevation with wherever the ocean will be in the future. So you would have to build a canal that is as high as the barriers would be, or any other structure that keeps the ocean out. I mean, the Dutch, who are sort of often referred to as the inventors of all this coastal management, built their system after a storm, a Christmas storm of 1950, I think it was. And so they came up with this incredible system that is supported by the whole country, where there’s a long tradition of water management. And yet they struggle today exactly with the same problem. Because that system was designed and built before sea level rise was on the horizon. IRA FLATOW: OK, interesting. Klaus, I have to take a break. We’ll come back and continue this discussion. It’s very interesting. Klaus Jacob from Columbia University’s Lamont-Doherty, and Dr. Rob Young of the Study Program for the Study of Developed Shorelines at the Western Carolina University in Cullowhee, North Carolina. Our number 844-724-8255. Also tweeting @scifri. We’ll be right back after the break. Stay with us. This is Science Friday. I’m Ira Flatow. We’re talking this hour about sea level rise, storm surges, how to prevent, prepare for these devastating occurrences as ocean levels are rising along the coastline all over America, all over the world. Looking for possible examples, possibly from the Netherlands. We know things are not working out as well as they might be expected there. Also, we were talking about what happens in New York City when it floods. And we were all shaking our heads here in the studio about Kim Stanley Robinson’s book, NY 2140, which exactly talks about how New York City in 2140 would have coped with sea level rise. And it’s a really good book as a reference book. It’s a piece of fiction, but it’s really interesting the way he has scoped all of this out. Also of note, today is the one year anniversary of Hurricane Harvey’s formation. That turned out to be one of the most costly tropical hurricanes in US history. Rob, is Houston going to look at building a sea gate there too, after getting hit so hard? ROB YOUNG: Well, there’s certainly some discussion about building the Ike dyke, as they’ve called it, since Hurricane Ike, going back a few years now, as a way to try and reduce storm surge impacts in the area between Galveston and Houston. And you know, I think it’s important to point out that such a structure would not have significantly reduced any of the flooding that occurred from Hurricane Harvey, since so much of it was precipitation driven. But that plan is certainly on the drawing board right now. And there’s a lot of, I think, interest in the idea within the sort of political class and decision makers in Texas. And there’s a lot of concern about the idea from coastal managers and environmental groups. IRA FLATOW: Let’s go to the phones to Marissa in Southbridge, Massachusetts. Hi Marissa. MARISSA: Hi, how are you? MARISSA: Well, I was wondering about the role of insurance companies and this question of assisted retreat. Because I’ve heard that in some of the cases, like in Long Island for example, and in New Jersey, people have now had their houses rebuilt multiple times. You know, the insurance companies are really paying a lot to keep rebuilding. Whereas, you know, these people are unable to move. So I was just wondering if aside from the politics, is there something the insurance company should, you know, be responsible for in helping these people relocate. IRA FLATOW: Go ahead, Klaus. KLAUS JACOB: –comment on that. Well, insurance companies have actually very little stake in flood insurance. We have a National Flood Insurance Program because the private insurance companies have walked away, in the ’60s and 1970s, from flood insurance because they know it’s fundamentally not insurable at affordable prices. So Congress then called for a national flood insurance program. And it’s nowadays in the order of $20, $30 billion in the red. Essentially we have, of course we have this National Flood Insurance Program allowed building to continue in zones that are now flood zones and building more so in the future. Both along the coast, but also along rivers because of more erratic, extreme rain conditions in some parts of the country. IRA FLATOW: In the couple of minutes we have left, I don’t know if it’s possible to come up with a comprehensive idea, Rob, about where to move forward. It seems like you have to change a social commentary about this. Or communication, or dialogue is the word I’m looking for, to create a dialogue. And it doesn’t seem like that’s in the wind, so to speak, at this point. ROB YOUNG: So I think that the solution ultimately, Ira, is to stop paying and subsidizing people in communities to make the wrong choices. And at the moment, one of the problems we face is that the federal government provides far more incentives for people to make a bad choice than to make a good choice. And that includes the Federal Flood Insurance Program, but also the Stafford Act itself, where we come racing into these communities. You know, even investment communities, resort communities, and we put all the infrastructure back after a hurricane. We create this giant moral hazard, and then we’re surprised when people make the wrong choice. So one secret to me, is finding a way to get federal dollars out of these areas that are identifiably exposed to hazards that we know exist today and to long term sea level rise. But you know, what we really need is national leadership. And here’s where I hate to end on a little bit of a pessimistic note. But we’ve been lacking national leadership on a lot of issues these days. And when we have a somewhat dysfunctional political system, and we have a national legislature that doesn’t really legislate anymore, my expectation that they can come together to provide a national plan for how we’re going to manage our shorelines in the future, which is what we really need, well my expectations that will happen are pretty low at the moment. KLAUS JACOB: I would say it’s not just the federal task. It has to be on the state and, more importantly, on the local jurisdiction level. We have so-called home rule in the United States that allows local jurisdictions to make most of the land use decisions. That is typically a very short term kind of horizon that comes about from these kind of considerations. And climate change and sea level rise needs and long term vision. So the federal government should provide the long term vision, and some carrots in terms of financing. But the real work has to be done locally by communities, and cities, counties, and without that, that will not happen. IRA FLATOW: All right, that’s interesting that we will wind up on that note. Klaus Jacob is geophysicist and research scientist at Columbia University’s Lamont-Doherty Earth Observatory in Palisades. He was a member of the 2015 New York City panel on climate change. Dr. Rob Young is director of the program for the Study of Developed Shorelines, and Coastal Geology professor at Western Carolina University in Cullowhee, North Carolina. Thank you both for taking time to be with us today. Actually, just to let you know, the Army Corps of Engineers is still taking public comments on that study for New York and New Jersey until September 20th. And you can visit sciencefriday.com/seagate to know how you can comment on that. Each year, we use nearly 50 billion tons of sand and gravel worldwide. Is that sustainable?